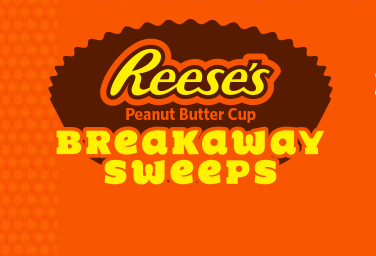 Reese’s Peanut Butter Cup Breakaway Sweepstakes – Win a trip to the 2017 NCAA Men’s Final Four! Win a trip to the 2017 NCAA® Men’s Final Four® and the REESE’S College All-Star Game & $1,000 spending money! ENTRY LIMIT – Limit one (1) entry per person/email address/Facebook account per day. ELIGIBILITY – Sweepstakes open only to legal residents of the United States residing in the 50 United States or the District of Columbia, who are 18 years of age or older at the time of entry. BEGINS AT 12:00:00 P.M. EASTERN STANDARD TIME (“EST”) ON MARCH 2, 2016 AND ENDS AT 11:59:59 P.M. EASTERN DAYLIGHT TIME (“EDT”) ON APRIL 12, 2016. PRIZES – One (1) Grand Prize. The Grand Prize consists of a trip for winner and one (1) guest to the 2017 NCAA® Men’s Final Four® and the REESE’S College All-Star Game that will take place at University of Phoenix Stadium® in Glendale, Arizona on March 31, 2017, April 1, 2017 and April 3, 2017; and $1,000 spending money (awarded in the form of a check payable to the winner). Trip portion of Grand Prize includes: Double-occupancy standard hotel accommodations for winner and one (1) guest for four (4) nights, two (2) tickets to the 2017 NCAA Men’s Final Four which includes two (2) tickets to the National Semifinals and Championship Final and free access to the REESE’S College All-Star Game. If Grand Prize winner’s residence is not located within 250 miles of Glendale, AZ, round-trip coach air transportation (from major airport near winner’s home within the U.S.) will be provided for the winner and his/her guest, at the sole discretion of the Sponsor. Approximate Retail Value (“ARV”): $5,490.00. Winner may take a cash alternative of $5,490.00 in lieu of the above-stated Grand Prize (trip and spending money). Forty two (42) Daily Prizes. Each Daily Prize winner will receive one (1) 1lb. REESE’S Peanut Butter Cup. ARV: $14.95 each.